LPILE - Analyze response of piles and shafts in multi-layered soil media. GROUP - Analyze response of pile groups in multi-layered soil media. APILE - Analyze the axial capacity of driven piles in mutli-layered soils. PYWall - Analyze flexible retaining walls in layered soils. SHAFT - Study the response of drilled shafts under axial loading. TZPILE - Analyze load-settlement relationships of vertically loaded piles with downdrag. 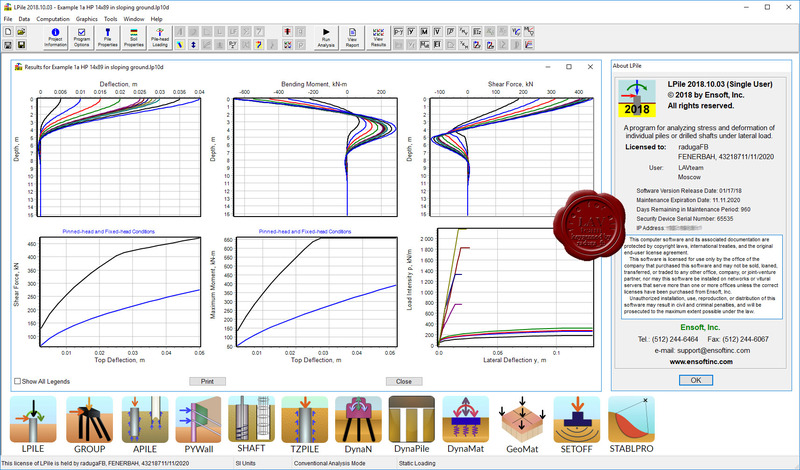 DynaN - Determine the dynamic response of shallow and deep foundations. DynaPile - Analyze the dynamic response of pile groups in horizontally layered elastic media. DynaMat - Analyze the dynamic response of mat foundations under dynamic loading. GeoMat - Analyze mat or structural slabs supported on soil media. SETOFF - Software for computing foundation settlement. STABLPRO - Software for computing the slope stability.